See photos of flag for sale.Flag Size 889mm x 660mm. Unused been kept in original bag in a drawer. Flag image is only on one side as this flag is intended to be fixed and viewed on a wall or window. 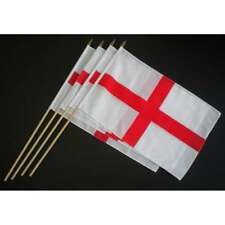 4 England St George Hand Flags 6" x 9" - 15cm x 22cm on a slim stick - for waving. One for you and three for your mates. One for you and three for your mates! Show you support for the England team in the Russia 2018 World Cup. One 5ft x 3ft England Flag. England Flag. 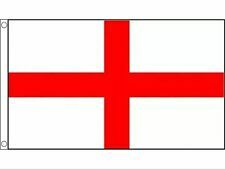 5ft x 3ft St George's England Nylon Flag. 5FT x 3FT St George's Flag. Flag size 4" x 6" (10cm x 15cm) with black plastic stick and black plastic base. Large Carlsberg England Flag Pub Decoration New unused 1.5m X 930mm. For sale 1 England Flag. Unused only opened to photograph. Size 1.5m X 930mm. Single sided to hang on a wall. St.George Flag. 3' x 5' Cloth. 5ft x 3ft St George's England Nylon Flag. 5FT x 3FT St George's Flag. Other Information. Three feet by two feet in size, made of lightweight polyester with England printed in white across the centre. England, St Georges Cross Flag 90cm x 150cm. Polyester with brass eyelets for hanging. Should you have a problem with any of our products, we are always here to sort things out quickly and painlessly! Giant 90cm x 150cm England Flag St George Britain English Brexit G.B. Product information is as follows: Giant 90cm x 150cm England Flag. Red and White with ENGLAND - Polyester with Brass Eyelets.12 Flags in Printed Clear Bag - 24 in Display Tray - 96 Flags per Outer. St George Cross Cloth Flag With Eyelets App 5ft x 3ft. 5ft X 3ft flag with eyelets. Flag size 4" x 6" (10cm x 15cm) with black plastic stick and black plastic base. 100% polyester. Featuring large square England flags, this bunting is plastic so perfect for either indoors or outdoors. Length 7m 23.9ft x 30cm. Linked MPN : Amscan - #992699. As per pictures England plastic headband. Flexible plastic. We will do our best to solve any problem. Contents: England Flag. Red and White with ENGLAND - Polyester with Brass Eyelets.12 Flags in Printed Clear Bag - 24 in Display Tray - 96 Flags per Outer. Select your choice of style/colour/size before checking out using the options provided where applicable. Cotton Linen Foldable Waterproof Laundry Basket Children Toys Storage Bucket Bin. 48cm EPP Foam Hand Throw Flying Gliders Launch Air Plane Kid Toy Random Colour. DIY Twisty Animal Unicorn Petz Magic Tricks Stitching Pet Girls Bracelet Gift. 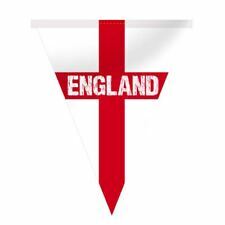 St. George England Fußball Bunting Enthält 10 Flaggen auf starkem Polyesterband Jede Flagge ist 22,5 cm x 15 cm Siebdruck Tuch Ammer 100% Polyester Farbe: Weiß / Rot Größe: 3m . Large 90cm x 60cm England Flag St George Britain English Brexit G.B.